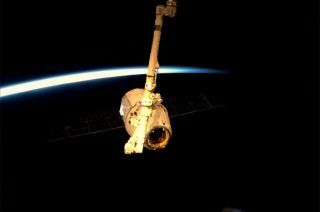 SpaceX's Dragon capsule is held by the Canadarm2 of the International Space Station, May 25, 2012. SpaceX's historic test flight to the International Space Station may be over, but the company's commercial Dragon spacecraft and Falcon 9 rocket will be flying again in just a few short months. The unmanned Dragon capsule returned to Earth today (May 31), successfully completing a mission that marked the first private flight to the space station. The mission, which launched May 22, was a demonstration to show that Dragon and its Falcon 9 rocket are ready to provide bona fide cargo services for NASA. The California-based SpaceX holds a $1.6 billion contract to fly 12 such supply missions, and the path now appears clear for them to begin. The first contracted cargo flight is slated for this September, Suffredini added. The second one will likely take place just a few months later, in December. NASA is looking to SpaceX and other private American companies to fill the cargo- and crew-carrying void left by the retirement of the space shuttle program last year. The space agency has also inked a $1.9 billion deal with Orbital Sciences Corp., of Dulles, Va., to make eight unmanned supply flights with its Cygnus spacecraft and Antares rocket. Orbital officials have said they're aiming for a test flight to the station this November or December, with the contracted missions to begin shortly thereafter if everything goes well. Private astronaut taxis aren't as close to being ready as the cargo craft. With financial help from NASA's Commercial Crew Development (CCDev) program, SpaceX is upgrading Dragon to carry up to seven passengers, and company founder and CEO Elon Musk has said the vehicle could be operational within the next three years or so. A handful of other firms — Blue Origin, Sierra Nevada and Boeing — are also designing and building manned vehicles with CCDev funding. All say they can likely be up and running in the 2015-2016 timeframe; NASA wants at least two vehicles to be ready by 2017. Illustration of SpaceX's Falcon Heavy rocket, which the company says will be the most capable rocket operating today. And NASA isn't SpaceX's only customer. The company's launch manifest lists about two dozen non-NASA Falcon 9 liftoffs between now and 2017, including eight for satellite firm Iridium Communications, Inc.
SpaceX is also working on a huge booster called the Falcon Heavy, which is expected to be the world's most powerful rocket when it starts flying. The first test flight of the Falcon Heavy — which SpaceX says will be able to loft 117,000 pounds (53,000 kilograms) of payload into orbit — is slated for next year. If all goes well with the testing, the 229-foot-tall (69-meter) Falcon Heavy may be blasting off regularly before too long. SpaceX announced Tuesday (May 29) that it had landed its first customer for the Falcon Heavy — satellite communications provider Intelsat. SpaceX's announcement did not list a targeted time for the Intelsat launch, or the total sale for the flight. SpaceX officials, however, have said that Falcon Heavy launches will cost about $100 million per mission, twice that of its commercial Falcon 9 flights.